Building musical paragraphs using short, irregular rhythmical patterns became a favourite Gregson formula in the early 1970s. The work called Patterms is the clearest and most disciplined example. 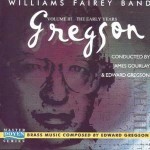 By limiting himself to a single musical motif, heard at the outset on trombones, Gregson was able to offer a true test of technique and musicianship in a concise three part structure. The opening is another Gregson prelude. The alternating patterns of 3s, 4s, 5s and 7s are bonded by a constant quaver pulse. The music here possesses a neo-classical, pristine quality. In the central episode, the same triadic figure is transformed into a lilting barcarolle-like dialogue beginning on solo cornet and horn. 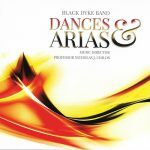 When the whole band becomes involved, the trombones add a moment of bi-tonal ambiguity, which sets in motion an exuberant Latin dance and final flourish. Patterns was commissioned by the Butlins Youth Brass Band Championships for the 1974 competition at the Royal Albert Hall.